I'm interviewed on The Dabbling Mum this week, talking about overcoming writer's block, sustaining a successful freelance career, and juggling parenthood and work. I also talk about my new book, Writer for Hire: 101 Secrets to Freelance Success, due out in just two months! Check it out! I started my freelance career with little more in mind than to escape the law. Sure, I had a financial goal (I wanted to make at least $10,000 my first year of freelancing full-time), but I didn't have much of a business plan. It wasn’t like I decided to freelance and then took a few business classes online or anything. Fact is, I had no business plan. But I did have a lot of energy, motivation, and drive, which certainly helped. While I lacked a business plan, I did set specific goals to keep myself on track. I sent out at least one query or essay submission every day, five days a week. When I received a rejection (what I call a "bong"), I sent a new query to the market that had rejected me, and eventually started getting assignments from markets like Bridal Guide, Fit, Fitness, Shape, and Family Circle. I also broadened my scope, and started writing for the local hospital and small area businesses as well. By my fourth year, I was making more than $60,000/year and was confident that I could sustain a successful career as a self-employed writer. Still, I had no idea I could make even more money than that. I was already making more than I had as an (admittedly underpaid) lawyer and I realize now it didn't occur to me that I could continue to increase my income, and make, say, six figures. Then I met another writer who made six figures regularly. And she wasn't a better writer than I was. She wasn't any more professional about her career than I was. And she didn't have that much more experience than I did. I remember thinking, hey, if she can make six figures, why can't I? Two years later, I cracked the six-figure mark (and wound up writing a book on six-figure freelancing along the way!). That's the power of example. When you see someone else reaching a goal (especially someone similar to yourself), you're more likely to believe that you can do the same thing. That's one reason I'm open about the financial aspects of my writing career, whether it's sharing what I made last year, surveying freelancers about their income, explaining the difference between print and electronic royalties, or how many copies of a POD book I've sold. As the saying goes, information is power but information is motivation, too. My hope is that by seeing what I've done (or what other successful freelancers have done), you'll be empowered to reach your own writing goals. ***My ebook list keeps growing! I've now added a new book designed for new writers who want to make the leap from unpublished to published--whether you write essays, short fiction, or articles. 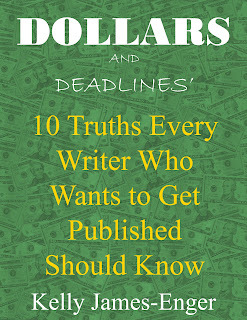 Dollars and Deadlines' 10 Truths Every Writer Who Wants to be Published Should Know will help you make the transition from writing for yourself to writing for publication. If you know you want to focus on writing articles, you'll want to check out Dollars and Deadlines' Guide to: Selling your First Article, which takes away the mystery of getting published for the first time. Dollars and Deadlines' 10 Essential Freelance Templates includes the 10 templates you'll use the most often as a freelancer and describes when to use them. Like many freelancers, I write primarily nonfiction. My work is a mix of articles (mostly service and how-to pieces) and my own books along with different projects for ghostwriting clients as well. Yet I keep a hand in another world--that of writing fiction. I sold and published two "chick lit" books (although I prefer to call them contemporary women's fiction) in 2002 and 2003, and often have some kind of fiction project in the works. 1. Do it first thing. When I speak on time management, I suggest that people “eliminate the ugliest”—that is, do the thing that you most do not want to do. By tackling the dreaded task first, you get it out of the way and free up the rest of your day from worrying about it. You also have the satisfaction of checking it off your to-do list. 2. Write every day. When I’m working on the draft of a novel, I work on it every day—even if it’s just writing a scene or a few lines of dialogue. It keeps my hand in, so to speak, and keeps my characters and my storyline constantly swirling in my mind. I’ve had some great insights into my characters walking my son to school, lifting weights at the Y, or eavesdropping at my local Caribou Coffee—because I’m always thinking about them. 4. Write about what you’re writing. This may sound confusing, but what I mean is that I take time to think about what I’m writing about before and while I’m working on a novel. So, for example, my first novel, Did you Get the Vibe?, explored the question of what would you do if you met someone you were overwhelmingly attracted to—but were in a happy, stable relationship? Would you act on it, or not, and why? Writing about the theme or issues you’re exploring can provide you with additional insights into your current project. 5. Wear a hat. Sometimes I need an external reminder that I’m in fiction-writing mode. I have several hats that do the trick. I plop one on my head, close my email program, and get to work, focusing on the task at hand—working on my novel. (I’ll admit with two little kids, this works better at night when they’re asleep.) You might burn a certain candle, sit in a certain chair, or wear a certain sweatshirt to signal your brain it’s fiction-writing time. I’m fortunate to be able to write for a living, but that means I sometimes chafe at having to give up time to work on a novel. I’ll tell you, though, that I’m always glad when I have—such as with this 90-day Writing Challenge! Getting a novel published, and hearing from writers who love my work, only makes it even more rewarding. Stay tuned for the announcement about new "hen lit" novel, to be released by end of March, 2012. And in the meantime, readers, what about you? Are you writing fiction and nonfiction as well? How do you balance both? I'm revisiting some classic freelancing topics over the next few weeks. Every time I speak about freelancing, I hear from at least one writer who is afraid to pitch an idea to a magazine--because the editor will steal his or her idea. Here's what I mean. Early in my freelance career, I was pitching dozens of different markets. I was thrilled when one editor took the time to call me and ask for story ideas. I spent a lot time coming up with a specific idea, researched it, and mailed the query. I didn't hear anything from her, so I followed up on the query. Still, no response. Still, I sent her another idea...and then months later, I saw “my” idea in the magazine, right down to the specific sidebar I’d suggested. A little strange, huh? So, how do you prevent an editor from taking your idea and assigning it to another writer? YOu write the best query you can--it's your only opportunity to make a first impression. Your query should demonstrate that you’re already researched the story idea. If you’ve already spoken to possible expert sources, quote them in the query. Cite statistics or recent studies if relevant. If you're pitching a profile and you’re received the subject’s permission to write about him, include that information. And highlight your unique qualifications in your ISG. Your goal is to convince the editor to let you write the story. A detailed, professional query that demonstrates why you’re uniquely qualified to do so is the most effective weapon you have as a new writer. Readers, what about you? Has an editor ever "stolen" your idea? How did you handle it? Want to get into the lucrative field of ghostwriting? I'm teaching my online class, Ghostwriting 101, through Writer's Digest later this month. It starts on February 23, 2012. Based on Goodbye Byline, Hello Big Bucks: The Writer's Guide to Making Money Ghostwriting and Coauthoring Books, you'll come away from the class with a clear idea of the types of work and clients you should pursue along with a marketing plan and a letter of introduction, or LOI, to use with new clients. And if you're in the Milwaukee/Madison/Chicago area and are serious about your writing career, check out the 10th Annual Writers' Fest, held March 9-11, 2012. I'll be presenting sessions on the benefits of specializing and on today's book publishing options; there are also sessions on everything from developing your platform to writing book proposals to memoir writing to social media. I'm looking forward to attending many of the sessions myself, and hope to see some of you there! Well, since then I've written dozens of articles for publications like The Writer and Writer's Digest. I realize that many of the articles I wrote even a decade before are still timely today. So here's a "blast from the past" from a column called "Dear Writer," where I used to answer reader questions for The Writer. (This was back in the days before blogs!) Note that the advice I offered more than a decade before is still good advice today! Question: How do you convey to a magazine editor that you’re qualified to write a particular article? If you have personal experience with the subject, it seems easy. But what if you’ve conducted research, interviewed people or done other legwork as you put together your query or proposal? Is this enough to qualify yourself as an “expert” in the eyes of an editor? Answer: Good question. When starting out, many writers focus on subjects that they have firsthand knowledge of or have personally experienced. In fact, this is a good way to get your foot in the door as a new or relatively inexperienced writer. For example, if you’ve successfully changed careers, you might pitch an article about the steps to take when considering switching jobs. If you’ve managed to save 30 percent of your income—while raising a family—you might use that experience to query an article on simple but effective ways to reduce your expenses. That being said, though, it’s probably impossible to have personal knowledge of all of the subjects you may want to write about, but you can still demonstrate that you know more about the topic than the average person. The way you do that is with your query letter, which should let the editor know that you’ve done your homework ahead of time. Consider a query for a diet story that starts out with “Americans are overweight. They eat too much and exercise too little” compared with a query that starts off with: “According to recent statistics from the Centers for Disease Control, 55 percent of the U.S. adult population is overweight.” Which query is more compelling? Which proves to the editor that you’ve done some background research? As you develop the story idea, include relevant facts, statistics or other pieces of information that reveal your knowledge of the subject. Then, in the final paragraph (what I call the “I-am-so-great” paragraph), highlight your qualifications and demonstrate to the editor why you are the best writer for this particular story. If you have personal experience with the subject matter, mention that, but if you don’t, emphasize what you’re bringing to the piece—that you’ve already done a lot of background research or have received permission from the person you want to profile to write about him or her. By reminding the editor of these facts, you can convince her that you are an “expert” of sorts—which will help you nail the assignment. ***Are you a new freelancer? Then check out my new ebook, Dollars and Deadlines' Guide to Selling your First Article, which provides a simple, proven process for getting into print, or Dollars and Deadlines' 10 Essential Freelance Templates. Can you Specialize and Diversify at the Same Time? Sure! I've been sharing the results of the 2012 Freelance Income Survey the last couple of posts (how much money freelancers made and the types of work freelancers are doing), and something occurred to me. Especially in today's changing freelance market, it makes sense to diversify the types of work you're doing. That doesn't mean you can't continue to specialize, though. Here's what I mean. Very early in my freelance career I realized that most of the writers I knew who making a good living weren't generalists. They chose to specialize, whether it was writing about business and technology; health and parenting; parenting and technology; or health and fitness. When I consciously chose to specialize (in health, fitness, and nutrition), my business took off. Even today, I find it easier to navigate the freelance world as a specialist with a depth of knowledge in several popular subjects. While the overwhelming majority of my work falls into the health/wellness/fitness/nutrition area (or my other niche, successful freelancing), you can see that the type of work I do varies. My point? Yes, I suggest you specialize, but that you perform a variety of different kinds of writing about your specialty as well. You'll stay more flexible in a challenging economy, and help boost your overall freelance income. ***Freelancers, what do you think? Two questions--number one, do you agree with my idea of specializing while diversifying? And number two, what topics do you want to know more about? I've been getting hundreds of hits on the blog lately but few comments. If you find this blog valuable, please chime in and tell me so...and what else you want to know about, freelance-wise. Thank you! Last post, I shared the income results from the 2012 Freelance Income Survey. Now let's take a closer look at what types of work freelancers are doing to produce their income. So, more respondents are making money from writing online articles (15.50 percent) than any other one specific type of writing, followed by consumer magazine articles (12.83 percent), trade magazine articles and editing (tied at 9.69 percent), copywriting/writing for corporations and businesses (9.44 percent), blogging (9.20 percent). I'm sharing the complete answers to these questions so you can see what type of work your fellow freelancers are doing and determine whether it's time to add it (or more of it) to your repertoire. If one in ten freelancers are making money blogging, and you're not, that may be an area to explore. But the opposite is true, too--if less than 1 percent of freelancers are making money publishing their own books (whether POD or ebooks), that may mean there's an opportunity that not many writers are currently pursuing. ***Are you a full-time freelancer who's constantly pestered by people who want to know how to get started in the business? :) Or are you new to freelancing, and want to make the jump from unpublished newbie to published writer? Check out my new ebooks, Dollars and Deadlines' Guide to: Selling your First Article and Dollars and Deadlines' 10 Essential Freelance Templates. Each is designed for writers who are new to freelancing, and will help you transition from unpublished to published writer.